Hearts to the Rescue: Cartersville, GA: TO ALL RESCUE ORGANIZATIONS! EVERYONE PLEASE PASS THIS ON AND LET'S HOPE WE CAN FIND HER DOGS! If your rescue took any dogs from Etowah Valley Humane Society in Cartersville, GA around 12/13/12 read on! Hi all, I called the party, Ashley Crumbley for clarification today on this. First, her dogs were stolen, than went to Bartow County AC , Transferred to Etowah Valley Humane Society in Cartersville Georgia on December 13th, and THEN were rescued to an out of state Rescue. WHO that rescue was, Etowah Valley will not tell Ms Crumbley for legal reasons /privacy laws. by calling her at: 1-678 368 3955 ( her cell which is always on). She desperately wants her dogs back! 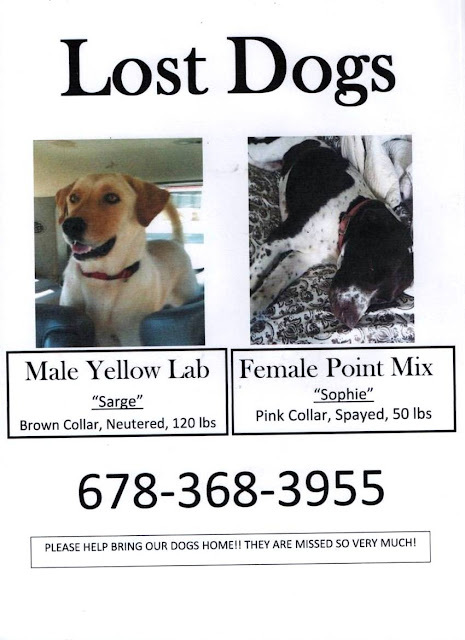 Male Yellow Lab ( nuetered) , Sarge and Sophie, (spayed),Female Pointer X. For large pic of these dogs, pls open the PDF file. Please forward far and wide. These dogs were stolen from their yard and have been missing ever since. Thankfully they were pulled by rescue but the trail goes cold there. Flyers attached. Our dogs were brought to Bartow County Animal Control December 3rd, They were transferred to Etowah Valley Humane Society in Cartersville Georgia on December 13th, that is where the trail goes cold.. they were sent together to an out of state rescue and have been seen since. Our babies were stolen out of our yard by a very malicious woman. Sophie, the female German Short Haired Pointer mix is heart worm positive, spayed and can be food aggressive. Sarge, our VERY large lab is neutered and is not very fond of men, he has light blonde freckles on his front legs. Please share with your rescue connections, the number listed on the flyer is my cell phone which is ALWAYS on me.